Turning 40 is a little bit like New Year’s Eve: the anticipation, the excitement, the resolutions and the chance to reflect on all of the experiences that have made up the past year (or 40!). Most importantly, a time to celebrate the achievements of all those years and have a suitably decadent party to boot! As time ticks towards the ‘big’ day, I’m surrounded by a mix of emotions: on the one hand I’m mourning for the 30s I’m leaving behind; the fact that I can’t pass for the early 30-something and being, quite frankly, terrified about having officially reached middle age. On the other I’m glad about what I have to look forward to, the challenges and the opportunities that the next decade will bring. Whether you believe that 40 is the new 30 or that age is just a number, a positive approach is just the tonic for any birthday woes. I believe that you have to both celebrate your achievements and have exciting things to look forward to. Being fitter in my soon-to-be 40s than in my 20s! As I mentioned earlier in my manifesto of positivity, I think it’s important to have exciting things to look forward to at any point in your life, but particularly when nearing your 40th birthday! As Winston Churchill once said ‘a pessimist sees the difficulty in every opportunity; an optimist sees the opportunity in every difficulty’. With this in mind, I started to think about constructing a bucket list. I think it’s important to look at a range of ideas: both long and short term to plan your goals effectively. The key is that it doesn’t have to be anything crazy: they can be simple, inexpensive or as big as you like! It should be a prelude to one of the best days of your life, but some proposal experiences have been known to get off to a bit of a shaky start! From red carpets and roses to wet-weather romance, there are proposal stories that will warm your cockles or make your hair stand on end. In our Spring wedding special blog, MC Concierge takes a look at the very best and worst proposals we could find! When he arrived home in the evening, the simple answer was waiting on a post-it: ‘yes!’. After returning home from work late one evening, Rachel found a note on the door with the first clue, she worked her way around the house finding gifts and notes that represented the years they had been together and their favourite moments. The final note asked her to call a mystery number and the voice on the other end directed her to head downstairs where her boyfriend was waiting on one knee. When Jessye was running some last-minute errands on a rainy Christmas Eve, her partner romantically filled the house with votive candles and rose petals. But when she got home, he was nowhere to be found. She waited immobile in the doorway, holding her gym bags and shopping- ‘when he finally walked into the room, he literally had to instruct me to close the door and drop my bags- I was in such a state of shock!’ she recalls. The most important ingredients to remember are to make it unique and personal- the rest will follow. It’s normal to be nervous at life-changing moments like these but try to remember that the audience of one – your partner – is the only audience that really matters. If you are planning something precise, it’s best to be organised: for example, if your dream is to propose on a moonlit shore- check your tide tables! Take your time to consider some special touches that are meaningful- is there a significant place you could visit, such as your first date? Or perhaps a special dish you could prepare that echoes a special time you have had together? Most importantly, take the time to enjoy your happy news together, before sharing it with family or social media- this is your special moment as a couple and deserves to be relished! For more information on getting your proposal just right, contact Maxine on 07863 235 901 or maxine@mhconcierge.co.uk. It’s the same for many of us at the start of each New Year: on the first day of January, with tender heads & over-indulged bodies, we solemnly swear a variety of oaths to ourselves. From doing more exercise to taking up a new hobby, resolutions are all well and good, but did you know that half of us are not confident that they will stick to the resolutions set for themselves? It seems that a new approach might be the answer, behold we herald: the Bucket List! From waking up to the Northern lights to swimming with dolphins, everyone has goals and dreams that they would like to achieve before they die. 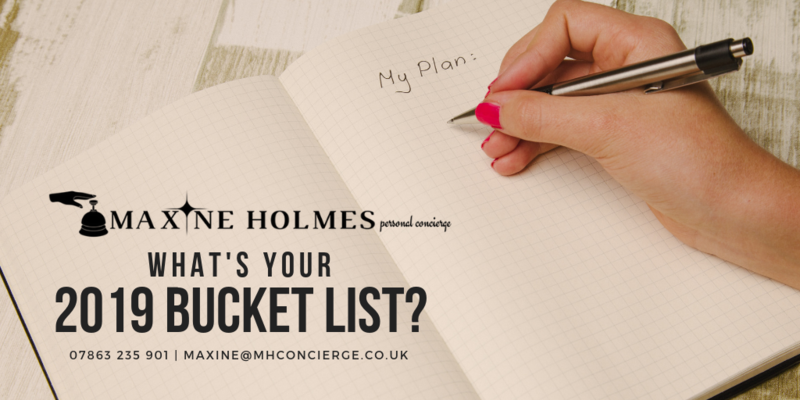 In fact, many of us carry these ‘bucket lists’ with us mentally every day, dreaming of all of the amazing experiences we would like to have, the sights we wish to see and the goals we wish to achieve. However, here lies the important distinction between bucket-listing and dreaming: the latter can remain inside one’s head, unfulfilled, but never-the-less hoped for; the former is a written list that gives accountability and the real chance of fulfilment. is your opportunity to use your imagination, perhaps even researching dreams that you never even knew were a possibility. After all, who wants a dull obituary? A top tip is to include a wide variety of goals, from a visit to a place that holds special memories to visiting Lapland, including a range of goals will give depth and meaningfulness to your ultimate list. One of the best things about writing your goals and dreams down in one place is that it gives your goals accountability. However, if you then stow the list on the top of the wardrobe where you might come across it in ten months’ time, it won’t be of much use! Decide on a place to keep your list: be it online, in a diary or even on the fridge- just ensure it is in a visible place where you can check back and update your progress. So you may have written down your goals and carefully stored them, but… now what? It’s time to consider the realities of how to achieve your goals and that means getting organised. Part of the challenge is fitting highly aspirational goals into everyday life, but here’s where long and short-term deadlines are essential. For example, if you are desperate to see the Sakura (spring cherry blossom) in Japan and it’s January, you may have some planning ahead and budgeting to do. On the other hand, if you’d like to go on a whiskey tour of Scotland, this might be just the time to start planning your journey. Whatever your goals, now is a great place to start. Happy listing! 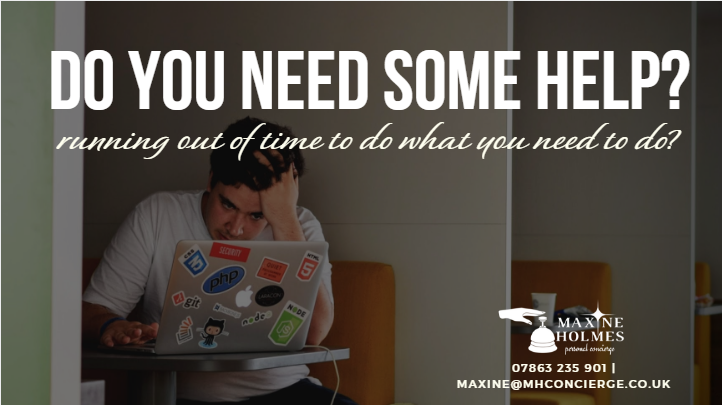 For more information on practical ways to conserve your time and reach your goals, contact Maxine on 07863 235 901 maxine@mhconcierge.co.uk. The decorations have been up in the office for weeks now; you’ve sent your last email and your party clothes are well and truly ready for an office outing, but how prepared are you really for the big Christmas shutdown? You may know what your agenda is for the last week, but many fall into the pitfall of overlooking other members of the team. Although being focused on meeting deadlines and preparing your workload for the last week before shut-down is undoubtedly a good strategy; if you work with a team, you will inevitably end up with more to do! Solution: Ensure that you are fully aware of other staff members’ last scheduled days of work and that they are fully appraised of your expectations for both before the shut-down and on return. This is also a great opportunity to thank them for their hard work and wish them a Merry Christmas also! Turn your phone off, secure in the knowledge that your meticulously worded out-of-office reply will give all the information they need to know between now and the New Year. Solution: No-one wants scenario A to be their Christmas Eve experience, so make sure that you’ve set an out-of-office email and voicemail message before you switch off on your last day: work stays at work and you get to enjoy an uninterrupted Christmas at home! It’s your first morning back from your Christmas shut-down and, in addition to the mountain of paperwork and emails that Santa’s elves somehow managed to deposit whilst you were away, you are left trying to pick up the threads from last year’s to-do list. Solution: It can be very tempting to just leave things as they are at the end of the year. However, if you want to hit the ground running on your return, making a to-do list with any relevant information that future-you may find useful can make that first week back much more productive and enjoyable. 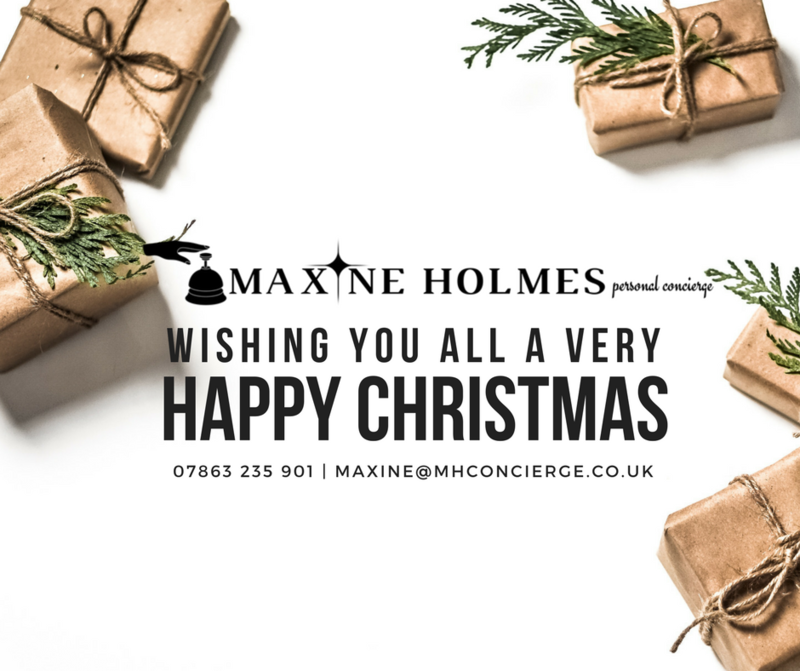 We wish all of our clients and followers at Maxine Concierge a wonderful Christmas and a very happy New Year. For most couples, getting married is one of the biggest adventures they have ever embarked upon and, quite naturally, they want their wedding day to be the best day of their lives. However, getting from the ‘would you’ to the ‘I do’ moment can take a lot more planning, organisation and preparation than most couples can imagine. After that first bottle of champagne and the happy news has been shared with the nearest and dearest, the next big question is: what do you want your wedding day to look like? There are many different incarnations and ways to get to that perfect moment; whether you envisage being on a sunny beach in Mexico or in your cherished local church. For a wedding day that is truly special and reflective of your bond as a couple, it can be an absolute blessing to have some help and know-how along the way. No one wants to be procrastinating over place-settings after all, the key is to keep it fun, relaxed and exciting. Need to find peonies in Autumn? Or source bridesmaid dresses which match the colours on your mood-board? Whilst miracles are usually few and far-between in real-life, having a wedding planner in the know, with the right connections and knowledge, can help make the impossible a reality. All too often, it is easy to get swept up in the glitz and excitement of wedding fairs. Before you know it, you have been talked into blowing the budget on a whole load of ‘necessities’. 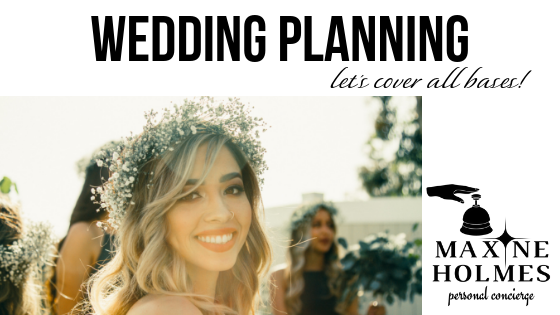 Having a wedding planner can allow you to be more objective in your spending decisions and offer budget-friendly solutions that are just as impressive as the ones on show at wedding fairs. Having someone in your corner from day one who shares your passion and drive to make your wedding day the day of your dreams can be a godsend for the busy couple. Whilst friends and family can offer their ideas with the best will in the world, often this can leave couples feeling like they are having to water down their dreams. A wedding planner’s main priority is the couples’ vision and that will remain foremost in their minds as they help the couple to navigate the exciting journey to their wedding day. There should be no politics or pressure to reach a particular decision, the focus remains on the couple and making the whole process fun! 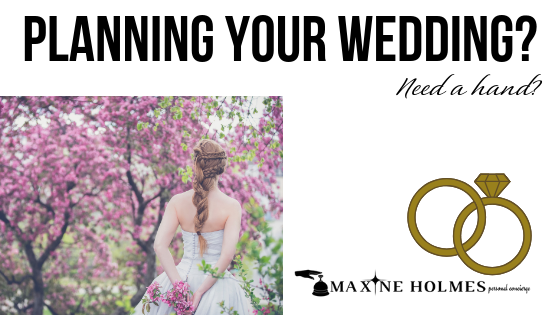 For more information on how to make your big day a beautiful reality, contact Maxine on 07863 235 901 or maxine@mhconcierge.co.uk for wedding planning expertise and much more! Back to school feeling – dread or delight? Why is it, as adults, some of us get that ‘back to school feeling’? The change of season and that crisp autumnal-chill in the morning makes us realise the summer is finally over. Light summer nights are coming to an end; darkness of winter will soon be upon us. Don’t despair! Think of it as a positive. Season change is great opportunity to get organised, set yourself goals and challenges similar to January; why wait until the New Year to face things head on? Whilst on holiday, I read a book called ‘Eat that Frog’ by Brian Tracey. It teaches you how to face your biggest tasks (those you’ve been procrastinating over for a while). The book describes this as your biggest ‘ugliest frog’. I have been following this approach to my work and it has made a difference in my productivity and assertiveness. My biggest ‘frog’ was actually this blog! Tackle your biggest task first, do not do tasks that have little impact on your day or week and do not get distracted by technology. This method makes you feel more motivated and therefore you achieve great results. If you’re finding it tough to beat the holiday blues and get back into the swing of things, take a look at the guide below. Write a list of all the things you’d like to achieve by a certain point in time. Start with something that will take a few weeks or months at first. Write down all the steps you need to take to achieve your goal. Write down all the tasks that are stopping you achieving your goal. Look at that list and identify things that make little impact or are low down on the list in helping you achieve your goal. What has the least impact? Does it really matter if you do not do a particular task for a few months or ever? Re-look at Review/Revisit (might be better than re-look) the important tasks. Make a daily, weekly and monthly list of the important tasks (things that will enable you to reach your goals). What is your biggest and most unpleasant task? Start with this first or ‘chip away’ at it breaking it down into smaller tasks like a piece of cheese; one bit at a time! Always start your day with your biggest task (your biggest, ugliest ‘frog’) once this is achieved you will be naturally motivated to do more. Don’t be a slave to technology; switch off your phone. Once you’re doing a task stick with it and complete it. Do not be tempted to check messages or emails; they will still be there in an hour. This distracts, and you will not complete you biggest task as you will be sidetracked. September is the ideal time to declutter or have an ‘Autumn Blitz’. Focus on one thing at a time. For example: the kitchen – what is the worst cupboard? Start with that, then move to the next cupboard and then change rooms. It’s a great time to pack away those summer clothes and pull out those snug jumpers or change to a thicker duvet. Don’t forget to keep a few summer items out for those out-of-season days – we all love in autumn! 07863 235 901 maxine@mhconcierge.co.uk and we can have a look at what your ‘biggest ugliest frog’ is and make a plan to tackle it together one day at a time! Have you ever felt that one minute you have all the time in the world to plan a holiday and the next minute, time has simply run out and you’re left with a bucket full of stress! Wouldn’t it be great to take a leaf out of Mary Poppin’s handbook, click your fingers and voila you have bypassed the prep stages! Planning your holiday should be fun and exciting, but for many it can be very stressful. You feel pressure to create that ‘perfect’ trip, visit five thousand landmarks, museums & seven wonders of the world not to mention dining in the crème de le crème of restaurants. The pressure to get it just right can over shadow what the trip was for and quite often, you need a holiday to recover from the actual holiday. Don’t despair, holiday planning can be stress free! Documentation is essential: check dates & validity of all passports & visas before you even begin! Eat & Watch: Create a list of the type of foods you love as well as your entertainment preferences. This will help with the holiday schedule! Check the weather: The picture may look lovely, but is there a tornado on the horizon? Shop around: For every provider there are at least three more that are cheaper! Spreadsheets are handy at this stage! Hand luggage that doesn’t weight the same as your suitcase! The 2:1 technique: pack two tops for every bottom! Plastic bags for the airport! Don’t forget to read the specs before you leave home! Travel itinerary: write out the times and dates of every mode of transport you use! Sign up for travel & health insurance! Maxine@mhconcierge.co.uk or call 07863 235 901 and I’d love to map out those holiday joys, one day at a time! Have you ever felt exhausted after prepping for a long-awaited holiday? Felt discouraged or even demotivated to go on the trip which has felt like it’s had a lifetime’s amount of planning? Holiday prepping can be incredibly tiring if not expensive. From the accommodation to flights, activities to meals, and not least the packing essentials, costs can run high! And then suddenly, whoosh, you’re off on the plane, one drink, a disastrous beach outing and a dose of the common illnesses and the holiday is up leaving you pining for a break to recover from the holiday break you just had! That’s not to say a holiday abroad should be avoided but to ease the stress levels (and the purse) below are our top three reasons as to why a stay-cation may be your ideal choice for this year. Local history: From churches to cathedrals, historical towns to ancient ruins; staying at home gives you the opportunity to explore your local history easily & without excessive costs. Most cathedrals and museums will offer annual passes for under £20. Theatre & cinematic trips: With school holidays reducing popular Blockbuster films to a fraction of the cost for children, to August’s ‘buy an adult, get a child free’ on selective stage productions; day trips can be incredibly entertaining. And better still you can return home, content and still have enough change for a little dinner treat! National parks: The UK is full of quintessential and glorifying national parks across the English countryside’s. Explore nature’s finest with families, friends or even work colleagues; giving you time and spectacular surroundings to rejuvenate and reenergize. Holidays from home can be the perfect getaway without going over the budget; giving you the opportunity to break up the year in mini, affordable breaks. To help explore the best of the best from your very home, I can help plan, source & set out day trips doing the things you love at a fraction of the cost. It is always better to be prepared so you avoid any unexpected surprises. This way you can just sit back, relax, and enjoy the journey. 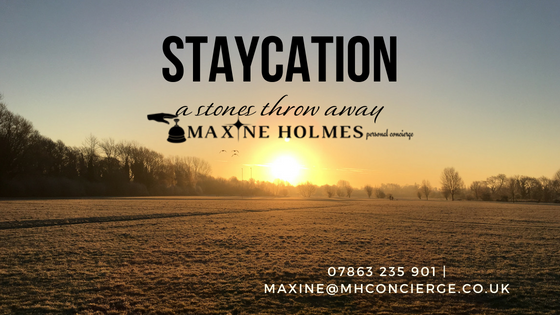 Maxine@mhconcierge.co.uk or call 07863 235 901 and I’d love to plan out those day trips and stay-cations, one day at a time! So Spring has finally sprung! Those sunny days which saw half the nation packing their winter clothes away, dusting off those shorts and pulling out those slightly tight summer tops may seem like a distant memory but don’t despair! Although the winter breeze is throwing our hair styles off balance, every wardrobe is always in need of a well-earned makeover and what better time than to start when the rain pelts against your window! With the long-awaited bank holidays coming up, put a spring in your rail of clothes and let’s hit the next batch of sunny days in style! But why the need for a declutter and a refresh? Is it really necessary? The simple answer is yes it is! Not only does it give you chance to revaluate what you have hanging up, but gives insight into what needs updating, changing or even donating to your local charity shop. From bold shades to comfy loafers, spring fashion is setting the way for striking clothes that sit comfortably against our bodies as well as our feet! Modify & stylize old garments: have an old dress, t-shirt or pair of jeans? Turn up the sleeves of the top, make cut off’s in the thighs of the jeans and accessorize the dress with a bold coloured belt or necklace. Upcycling made easy! High five to tie-dye: 90’s must have but not completely archaic! Trying experimenting with dyes and elastic bands on last year’s top which you love but don’t want to discard due to that persistent wine stain! Trusted top kept, redesign complete and all through a simple jar of dye! PJ’s into clothes: Have an overgrown t-shirt or knee length top that almost looks too good to be PJ’s? Don’t stop at the thought, try it on with a curtain rope wrapped around the middle. Hike up one side of the top and sew a running stitch about 10cm long. Believe me, it looks more stylish than you think! Faded & tired: If the garment is beyond repair of upcycle capabilities, it is time to donate! Donate everything that you know you will no longer wear, but don’t forget to save the pants for the actual bin! Trusted cardies: Don’t discard all those winter clothes just yet. Cardigans and jumpers come into use at any time of the year. Instead, why not keep a handful of trusted favourites in the wardrobe or on the top shelf and store the rest in the attic for our actual winter season! List-making: Finally, once you have sifted through your current collection, make a list of what is needed and where you could get them from. This gives you focus when shopping especially if you are on a budget! Can’t face doing this exercise alone? Have no fear, clothes are my ‘thing’ especially other peoples! There is nothing I love more than going through my client’s wardrobes, helping you organize, revamp and revitalise. I can even take your charity items to the shop giving you time to relax! 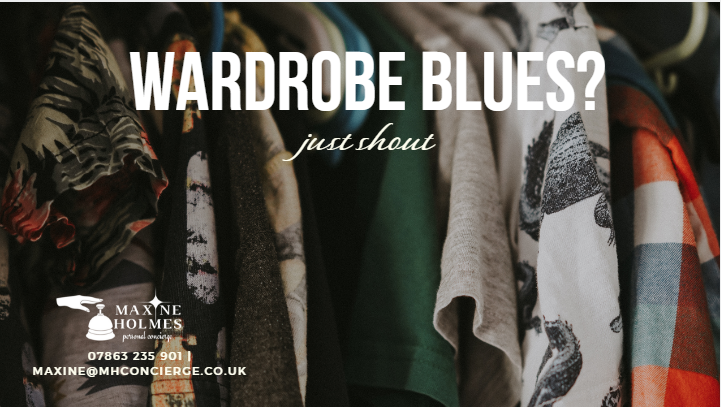 If you’d like help revamping your wardrobe, boosting your confidence and that opportunity for a well-earned treat, email me at Maxine@mhconcierge.co.uk or call 07863 235 901 and I’d love to bring fun to your door, hanger by hanger! A Lifestyle PA is more affordable than you think. Lifestyles Personal Assistants (PA) tend to be seen as runarounds for the rich and famous. We know celebrities have one but we never see their name or photo in the paper. But what is the reality of having a PA at home and do you really need to earn a certain income to employ one? In today’s society; stresses are mountable. From juggling work, combatting transport links, busy home life with parenthood, often time spent socializing is pushed to the bottom of the agenda; as for hobbies or something ‘fun’ it becomes as dormant as the screensaver on your laptop. Although we may dabble in hiring cleaners or gardeners our reluctance to employ someone who can help us manage our stress loads is palpable but it doesn’t have to be. 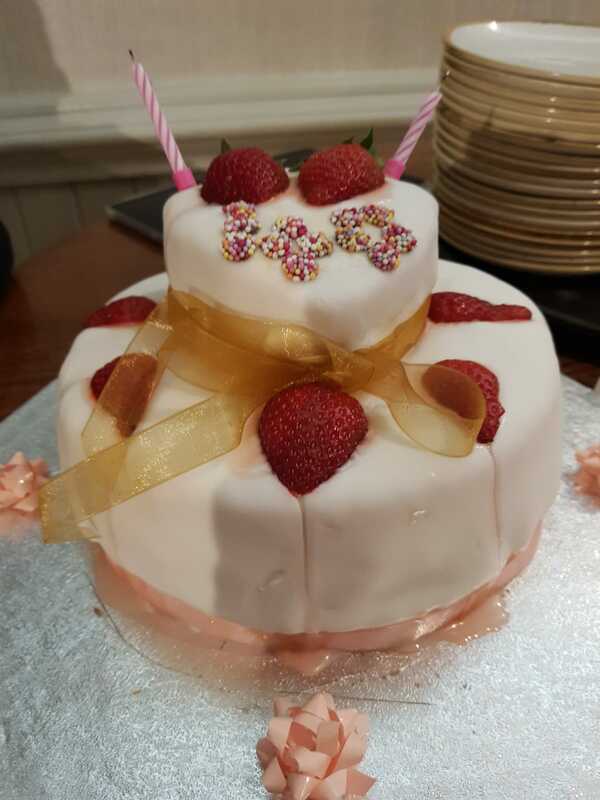 Lifestyle PA’s offers the chance to focus on what is really important, be it your career to your role as a parent, friend or a relative at a special occasion. A Lifestyle PA helps you to turn your efforts to what time otherwise passes by on; helping you with errands, jobs around the house, party organization, travel bookings etc.. It gives you the chance to breathe a little and do the things you love! Stress can have an catastrophic impact on your health as well as your relationships. In light of April’s Stress Awareness Month; give yourself opportunity to identify the stresses in your life, isolating what is stressful, how you could manage it and time constraints. You will be surprised by the answers you write down. I conducted a similar exercise with a pilot group of ‘busy professionals’ asking how stressed they felt, what were the main stress conductors and how they would destress/or like to destress from them. Their answers? ‘Getting on top of their ‘to do’ list, not enough hours in the day and too much time spent at work’. After working, they just wanted to come home and relax, creating a mountain of extra jobs come the weekend. A weekend that would otherwise be dedicated to socializing, day trips or hobby events. Delegating mundane jobs can significantly alleviate stress levels; helping you to focus and concentrate on what is important, what you enjoy and what is paramount in your life. The most common questions I get asked is ‘how much is a Lifestyle PA’, and ‘I can’t possible afford someone to do what I can do for free’. 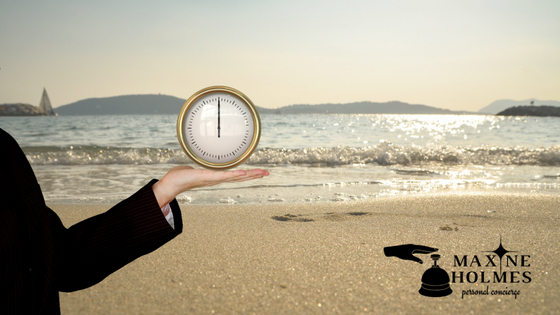 My advice is always the same: how much do you truly value your time? For the price of a takeaway not only can you reduce stress to concentrate on more exciting and profitable tasks but it can help you maintain a healthy lifestyle. Lifestyle PA’s are not for the rich and famous; they are for any one person who wants to reduce stress and make time for what is precious in life. 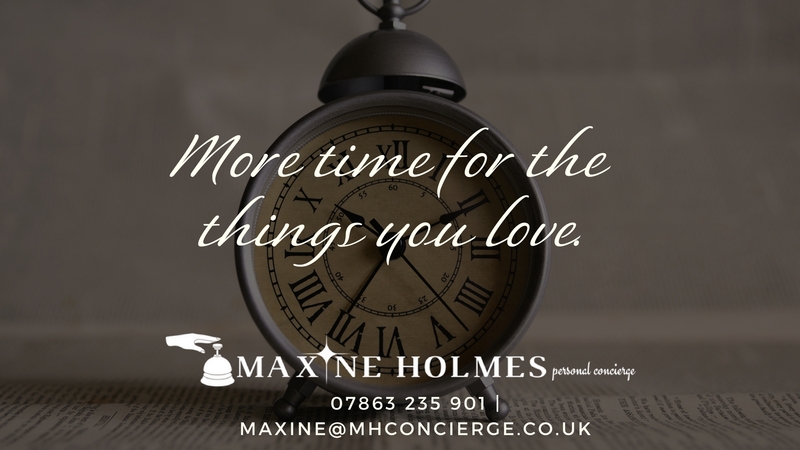 Maxine@mhconcierge.co.uk or call 07863 235 901 and I’d love to bring happiness to your door, one day at a time!